Is there a doctor in the house!? It doesn't take one to know how to tie the Surgeon's Knot. Nope. You don't have to be a genius for tying this surgeon's fishing knot. It's so easy and really quick to tie. As you may have guessed, the surgeon's loop knot acquired it's name from how surgeons tie up the sutures when stitching up their patients. This simple fishing knot is one of the best for connecting two lines together of similar diameter. It's stronger than the complicated blood knot. However, the one con is that it bends at the knot to veer off to the right. I wouldn't let the ugliness of this knot deter you, because if it's good enough to hold a wound together, then it should be trusted well enough to bring in those big fish. 1. Place about 10 to 12 inches of fishing line next to another - the tag end of the main line past the tag end of another. 2. Form a loop with the two lines. The loop should be about a few inches big. 3. With the tag end of the main line and the new line being attached, pass those ends through the loop the same way a regular overhand knot is done. Wrap those ends through the loop twice. Twice is efficient, however, you can pass it through once more to create a triple surgeon's loop. 4. Begin pulling on all four lines to form the knot. Moisten the knot and pull tight to complete the knot. Trim the tag ends. 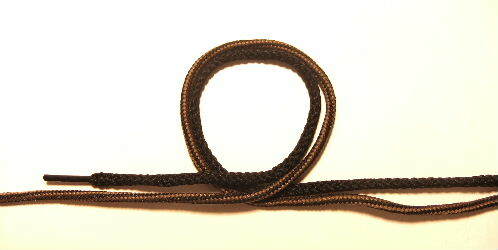 Anglers enjoy using this knot for freshwater fishing, saltwater angling, and fly fishing tippets and leaders.